Tony's Killer Beef Jerky is a brand of Beaver Mountain Distributors of Beaver, UT. I found this brand while driving down Highway 76 just outside of Pala, CA. A guy had set up a roadside jerky stand. I asked him if he was Tony. He said "no", it was his father, who makes this jerky up in Utah. I tried calling Beaver Mountain Distributors but got only a recording. I left a message and haven't heard back. I called again later, and got the same message. Doing some research, I found that this jerky is actually made by a company called Springville Meat & Cold Storage in Springville, UT. When I called them, they explained that Tony doesn't really make the jerky, they do. I'm assuming Tony is the guy who runs Beaver Mountain Distributors. Beef, flavoring supplement (salt, dextrose, corn syrup solids, maltodextrin, spices, spice extractives, calcium silicate, soybean oil), vinegar, brown sugar, liquid smoke, salt, spices, garlic powder, sodium nitrite. The first thing I taste from the surface of these pieces is a smoky flavor, followed by a saltiness, and a light black pepper. The chewing flavor starts with some natural meat flavors, a little bit of garlic, and a soy sauce flavor. For being dubbed "Smokehouse Original", it definitely has a smoky flavor, as well as a smoky aroma. Even though it lists liquid smoke in the ingredients, the smoke flavor in this tastes quite good. The flavor that seems to dominate my taste buds is a combination of the smokiness, the saltiness, and the natural meat flavors. All three seem to share equal strength. The saltiness is at a higher level, perhaps somewhere between moderate and high. Meanwhile the natural meat flavors are nothing spectacular, though clearly noticeable. The vinegar listed in the ingredients is noticeable as I chew, and provides a light tanginess. After eating several pieces, the vinegar seems to gain strength and creates a taste that lingers in the back of my mouth. The black pepper and garlic add a light bit of color to the overall flavor. I mentioned soy sauce above. Even though I don't see it listed in the ingredients, I can taste something that resembles its flavor. Perhaps it's the combination of salt, vinegar and natural meat flavors that mimics it. Overall, what you're going to notice the most in this jerky is a heavier saltiness, a good deal of natural meat flavors, and smokiness. Then you'll discover a light tanginess in the chewing from a vinegar flavor that creeps up on you over the course of several pieces. You'll also notice touches of black pepper and garlic. These are slices of whole meat, sliced to a medium thickness, and in small to medium sized slabs. This is a dry jerky with a slightly sticky surface feel. These slabs are flexible, bending almost all the way around with little cracking. Tearing pieces apart with my fingers seems easy to do, and chewing seems easy overall. The chewing texture starts out feeling chewy and woody. There's a fair amount of initial chewing resistance. After several chews, it breaks down into a soft in about 20 seconds. At that point, it feels just like a chunk of steak, one cooked medium-well. I can see some bits of fat on some pieces, but nothing significant. There's a fair amount of stringiness in the chewing, and also noticeable tearing pieces apart with my fingers. I don't see any gristle or tendon on these pieces. I did, however, find some small unchewable wads of tissue here and there. As for clean eating, there are some small bits of pepper that fall off on to my lap as I tear pieces apart. My fingers also pick up a faint bit of stickiness. I bought this Smokehouse Original variety from a roadside jerky stand in Pala, CA at a price of $20.00 for three packages. Each package weighs 4oz. That works out to a price of $1.67 per ounce. 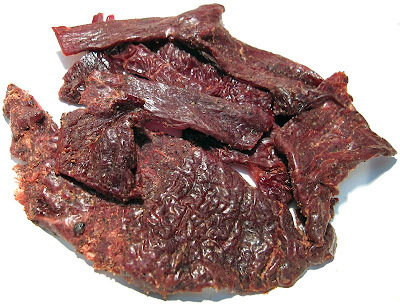 For general jerky snacking purposes, at the $1.67 per ounce price, it seems to provide a good value. I'm picking up a fair amount of snackability due to a satisfactory overall flavor, good meat consistency and good chewing texture. That price is slightly lower than you'd pay at a grocery store for major brands of jerky. Yet it seems to provide a comparable snackability. As a "Smokehouse Original" beef jerky, at the same $1.67 price per ounce, it's a good value as well. I do pick up an easily noticeable smokiness, albeit through liquid smoke, but yet it doesn't quite have that chemical character you find in other liquid smoked jerky. 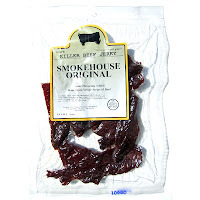 This Smokehouse Original variety from Tony's Killer Beef Jerky seems to provide an overall satisfactory flavor, through a combination of natural meat flavors, saltiness, and smokiness. There's a vinegar flavor that starts out subtle, providing a tangy chewing, but eventually grew stronger as I ate more pieces. The meat consistency is good, being easy to tear apart and chew, though I encountered a fair amount of stringiness that often got in the way. Otherwise, it chews like eating a piece of steak. But in comparison with all the other beef jerky brands I've had, this provide any "wow factor" for me, and it doesn't really come across as anything above average. It seems to deliver on a nice flavor and chewing experience without really giving you something above the norm. My recommended beer pairing for this, something heavy on malt, such as a barley wine, will pair well with the vinegar flavor in this jerky. Try the Lagunitas Gnarley Wine or the Stone Old Guardian. We bought some of this from a guy selling it by the roadside. It was so unbelieveably salty that we couldn't taste anything but the salt. 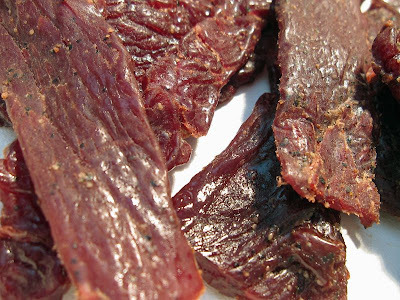 We were hoping maybe we just got a bad batch, but the elk jerky we tried was just as salty. Seriously - it made my lips dry out. Love his jerky !!! The Elk is great as is the Venison and Buffalo. Always good. My daughter just loves it. I love how the flavor really pops! tge money was so worth it!!! I bought it from a guy on the side of the road. I think i just found my favorite jerky. Never tased anything like it. We were tricked into buying from a guy off Hwy 1 outside Anchorage Alaska and said his son made it when it's really made in Utah. Way overpriced for the $17 dollar price tag!!! I also bought some from the guy off Hwy 1 outside Anchorage. I had fantasies of some hunter smoking jerky up in the woods. Once again my dad was right. Instead of getting ripped off I should have just bought some jerky at Costco!